The "West Loop" was built in the early 1970s, about the time of the "East Loop". Unlike the East Loop, the West Loop was two lanes, and didn't even connect to the East Loop, each went around what was the Highway 6. The West Loop converted into a (mostly) four lane road (with turn lane) sometime in the late 1980s (I think) and was rebranded as Harvey Mitchell Parkway in 1999. Originally, the way that this post worked was that there were 13 "stories", which roughly go down 2818 from south to north, but were contained chronologically within itself. The Red Barricade is no longer with us, but it was a curiosity for years. Like the red barricade at Wellborn, the red barricade stood there, but it was a curiosity since it was located off to the side and there was nothing in front of it. As it turns out, it marked where Dartmouth would come in (it was planned for years, and in the mid-2000s once proposed to the "city center", complete with a roundabout and numerous new buildings). Regardless, I still remember it, as it was there for so many years. The Citibank used to be First American Bank. More on FAB (which was a local bank) will be discussed later when we get around to talking about Momentum Plaza. One of my earliest memories was...never mind. It used to be our family's main bank, but we switched around the time of/before the Citibank rebrand. There's also an Exxon here, with its tall sign (again, before ordinances). 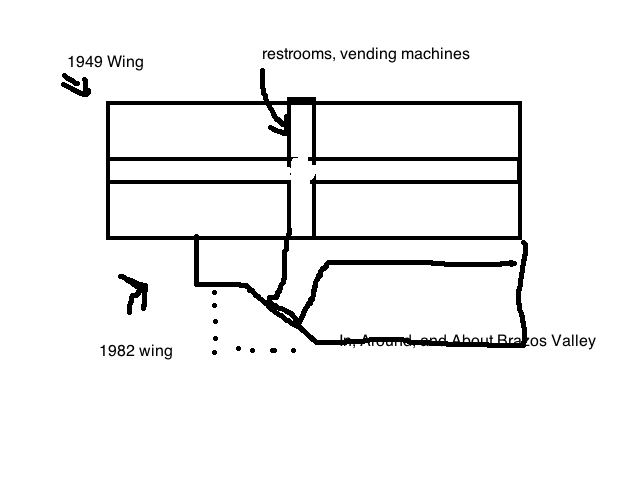 I wish I remembered the convenience store before "Frankie's" (probably a generic Exxon convenience store). Frankie's seemed to get a sleazy reputation after a report a few years back when it was one of the sellers of synthetic cannabis (which was later banned). There's a Periko used car lot behind here, which used to be something else. Does anyone remember what it used to be? All I can tell you about Periko is the obnoxious advertising that only ran for a few months, which featured just some guy talking, with another guy in a parrot costume shouting "PERIKO! PERIKO!". It's a lot less funny than it sounds, unfortunately. The name "College Station Business Center" invokes something grandiose, like a small cluster of mid-1990s office buildings, all mid-rise, looking fairly nice with fairly high rent. Read more about it here. We don't cover apartment complexes on this site typically but for now we'll make an exception, since three things are in play. #1: This isn't a dedicated post, so it's more acceptable. #2: Doux Chene Apartments has never changed their name since day one, which makes it more acceptable than others who slap a new coat of paint on their dated apartment complexes and name it something more attractive. Honesty is always nice. #3: It had an upscale restaurant there at one point. From circa 1974 to late 1970s or early 1980s, it was "Mansard House". Mansard House, despite being the upper level of an apartment complex on the edge of town (sure, why not?) was one of the really nice places in town. 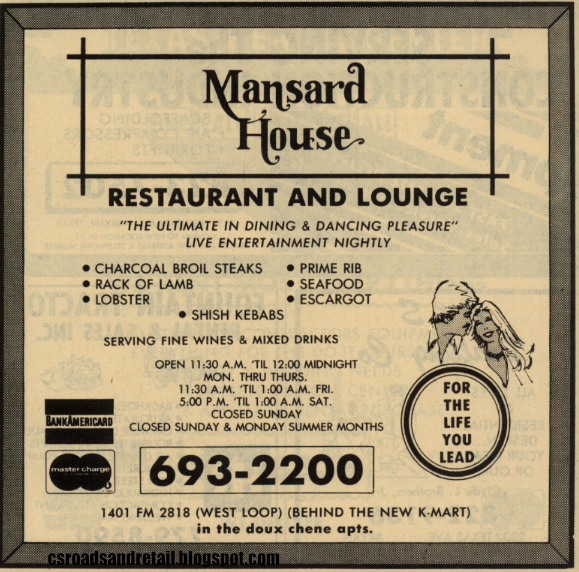 Live entertainment, seafood, lobster, lamb, and more were all on the menu. "For the life you lead"? What's that supposed to mean? Later on, it was also a nightclub called "Studio 2818", "Dallas", then "Scandals" (there might be more) but eventually everything closed and it's just an empty space. This was built maybe 1997 (before my brother entered high school) as a modern building with a convenience store, white awnings, Popeye's (with a drive-through window), and Zuka Juice (a smoothie shop). Within a few years, Zuka Juice was acquired by Jamba Juice in 1999 but shut down in the early 2000s (2001-2002), never to be seen again in College Station (it once had another store near Barnes & Noble) until the University Town Center opened in 2005. I once believed them to be totally extinct until a visit to Houston in 2003 (remember--this was before Wikipedia). In the mid-2000s, Popeye's shut down (it was small and dirty) and the withered awnings were replaced with blue awnings. It wasn't until maybe 2009 that it started to come back to life, with a new bank rebuilding the Popeye's drive-through, and Donald's Donuts replacing the Jamba Juice area. As I got into high school, I realized that the gas station was not as great as I once thought it was. It was always overpriced (similar to how the gas stations on Northgate are priced a dime higher per gallon to elsewhere in town). It was where the "bad kids" went behind the school to smoke (this wasn't hearsay, I actually witnessed it. After I got out of high school, there was a fight here that made the local news). When I was in high school, a clerk was shot in a late-night robbery. We used to have a post on this, but I took it off because I wasn't satisfied with it. More on this later. There's an old building off 2818 on the south side between Wellborn and 2818. Whatever was there didn't stick around for very long. I think it's empty now. No idea what it was or what it was built as. Growing up, this used to be an intersection with two overhead blinking lights blinking red in each direction. 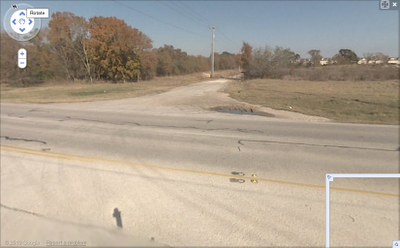 Before my time, FM 2818 was once two lanes, but it was modified to four lanes. With four yield lanes on every side (except on the southbound Wellborn-to-westbound FM 2818, where it was a merging lane), it barely received any traffic during the daytime. Cars stopped, and went. You'd be lucky if there were cars at all four areas. By 1997 or 1998, it was not going to work as a long-range plan, because traffic had increased, so a stoplight was installed. As traffic sources built up in all four directions, the intersection got increasingly busy, and the railroad complicated things during rush hour. I remember my father telling me that they were contemplating building an overpass (something, at the time, seemed unbelievable: the final product was completely unrecognizable for months), that it would take five years to start building, and another five years to finish. He also told me that the fields surrounding it would fill up with business. While the north side was developed with The Woodlands ca. 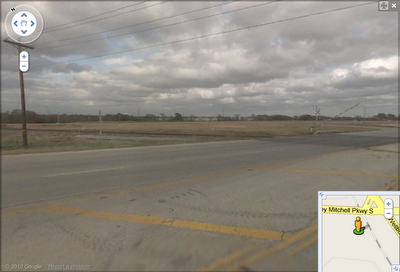 2006, the south side remained (I always heard rumors of a Wal-Mart Supercenter there). Around 2008, the gravel piles on the southeast side that had been there for years and years started to get bigger. A lot bigger. 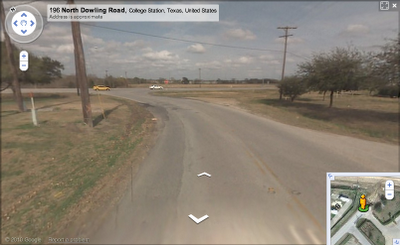 A huge dirt pile appeared off of Dowling Road, and I remember when the first new railroad crossings went up. From June 2009 until around spring 2010, it was a mess. You couldn't turn from North Dowling Road in or out at all (and they took out trees and that little streetlight at the corner, installed in the early 1990s to help drivers turn at Dowling), and from Jones-Butler, it was only right in, right out. Many times we had to turn around at the Shell gas station to get home, or worse, make U-turns to get into the airport. But eventually it was completed. The detour roads constantly shifted (Wellborn was moved at this time). I got these from Google Maps Street View back in 2010, before they were removed. In the late 1990s or early 2000s, someone had the bright idea of parking their car in the area between Harvey Mitchell Parkway and what is now Moore Supply Company (though it wasn't Moore Supply Co. back then), and putting a "For Sale" sign on it. This, in turn, was a success. The car was sold, and other people started to put up their cars in the space to be sold. At one time there was up to five cars, and no less than 3, until the company (or the county) that was there got fed up with people parking their cars there, and put up "No Parking" signs in the area. Like explained below, there was a time not too long ago when Luther didn't have many apartments on it at all, maybe one or two instead of the full lining of the south side like it is today (as the north side is still owned by the University). Since Marion Pugh often got clogged and difficult to turn in and out of George Bush Drive, the next best option was taking Luther Street West to Harvey Mitchell Parkway. Unfortunately, the topography of 2818 is less than ideal, and in 2005, a slew of accidents, including one where a woman with a head injury had to be airlifted to the Temple Scott & White, finally forced the city to put up a median in 2006. This separated it from the last segment of Luther, which led to the poultry science building. Eventually, a light was put up in late 2007, which annoys many drivers to no end. Since they'll add a light at George Bush and Penberthy after extending it to Luther Street West, I'll be satisfied if they disable the lights and add a median that prohibits left turns (perhaps also renaming the poultry science section as "Poultry Science Road"), or if they blast it through to Dowling Road. But neither of those will happen. 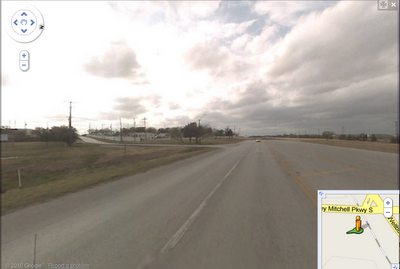 In the blissful days before 9/11, FM 2818 was far more rural than it is today. 2818 Place was just open countryside, the power lines and streetlights had not yet invaded, and Luther was practically empty. One of the things was that Easterwood Airport had a white picket fence, probably no more than three feet in height. It also had a curious little military "obstacle course" (or at least someone told me it was some sort of obstacle course) that resembled a playground, somewhere around the fence near George Bush Drive. I forgot which side of the fence it was on (probably their side), but it was demolished circa 2002 when the picket fence was demolished for a six/seven foot barbed wire topped metal fence which is in place today. 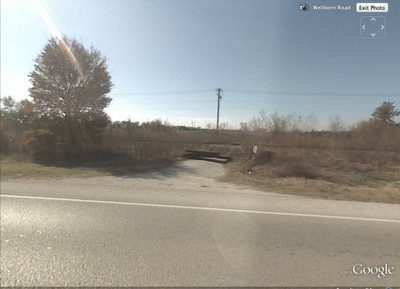 If you continued down FM 2818, you would get to the Bryan entrance. Now, it's all torn up now, but you would go down a long hill, and pass by a huge Exxon sign. It's now run down, with the taller Exxon sign completely smashed out, and the convenience store painted tan. The Shell billboard was there, always, (repainted once), but always displaying the price. There was the "Welcome to Bryan" sign, drop to 50MPH, and the hanging lights at Villa Maria and 2818. I think there was a time when the Exxon was not even there, and for a while, the left hand turn light had this funky grating on it so you could only see it when facing it dead-on. This remained until they started construction on the overpass, and by the time that happened, there were several changes: the new northbound part directly connected to the older Shell, the whole northwest corner behind the Exxon station (been there for a while, includes Subway, Wells Fargo, a dry cleaners, and a Popeyes--though Popeyes updated its signage as of late) has been torn up for that new Walmart Supercenter I've been hearing of (and they just opened a new Walmart grocery store, too), while there's a Shell with McDonald's on the other corner. They started construction on the overpass and closed off the familiar old fading stoplight (and the streetlight that glowed green because it was mercury vapor), and on Friday, July 12, I saw that the stoplight was the same as it always was (having been covered for months due to reconstruction of the old southbound lanes of Harvey Mitchell into the new frontage road), but on the way home, they updated most of the lights on the unit and added the "grates". That's not how I remembered it! The Turkey Creek lights, as I found out, were the one of the last holdouts in what used to be a pretty common occurrence in B-CS, and as of January 2012, they're gone. 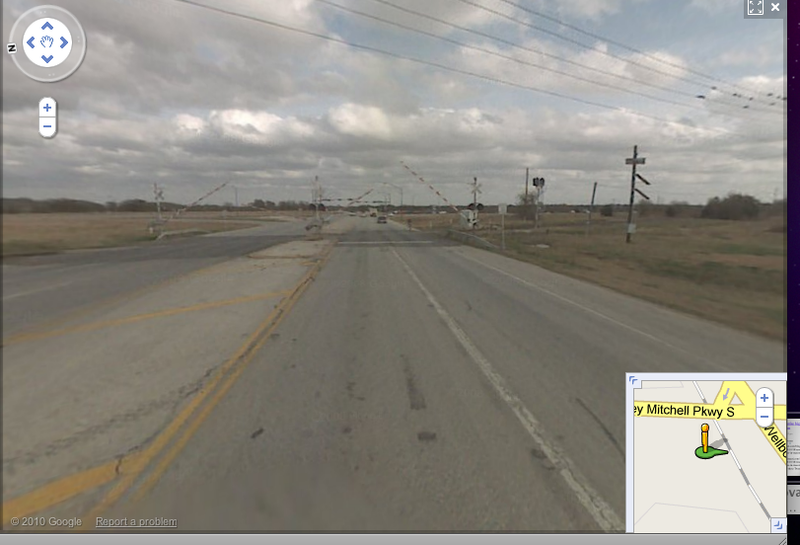 They WERE at the intersection of 2818 and 6 (north side), maybe were (are?) at Sandy Point, maybe was at Leonard. Leonard is a real stoplight now, and I know the two gas stations were originally something else. One was a Mobil until relatively recently (and by "relatively recent" I mean "sometime in the mid-2000s"). 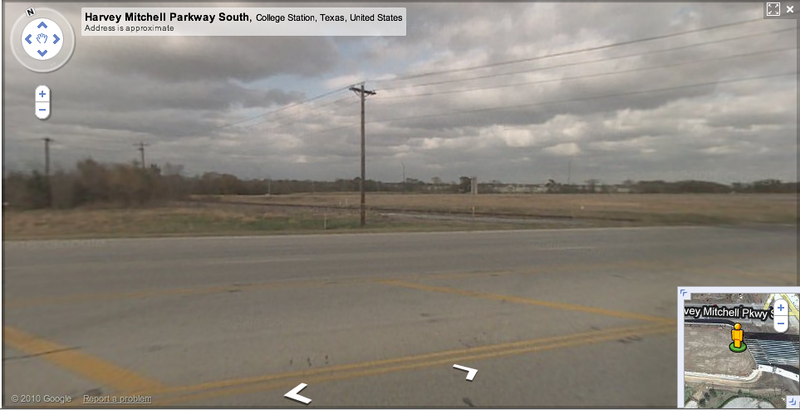 There are no more active Mobil stations in College Station-Bryan to my knowledge. First off, some recent research suggests that this part of FM 2818 pre-dated the West Loop (forgot what it was called--it may have been FM 2818). The Texas Hall of Fame was here, which was a dance hall, built in the 1970s but closed in early 2012 or late 2011 and was torn down for a huge Walmart that hasn't opened yet. North of Leonard is Scarmardo Foodservice Inc., with large "Scarmardo Produce Co." sign on the side. This is the company that operates the Farm Patch farmer's market on College Avenue in Bryan, and prior to the outsourcing, supplied a significant amount of food to the Texas A&M Dining Service before they switched to Compass/Chartwells, which prefers to serve corrugated cardboard rather than locally sourced food. Go figure. The "Industrial Park" area began with the Texas Hall of Fame for me, which I never understood really what it was as a kid (and now it's gone...), then the trucking company, then the Budweiser bottling plant, and a few other entities, all clustered together. 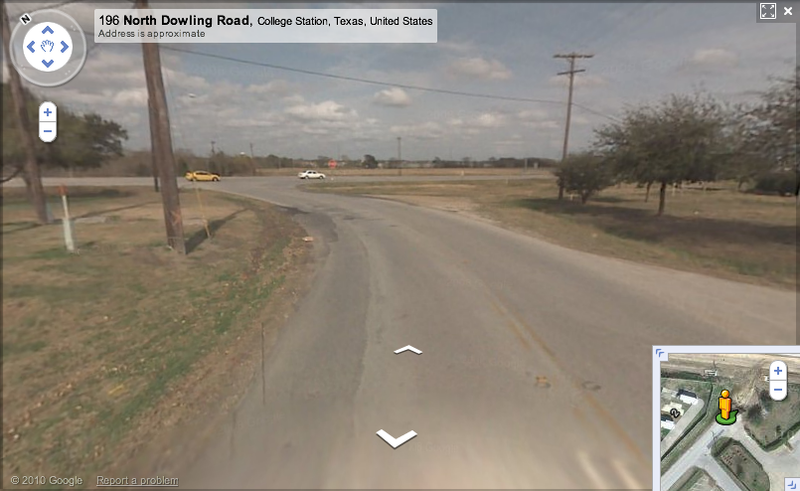 The railroad would go overhead (which was the westbound railroad out to Caldwell), and there would be two roads that paralleled FM 2818 but ended at the railroad or turned off into parts unknown. 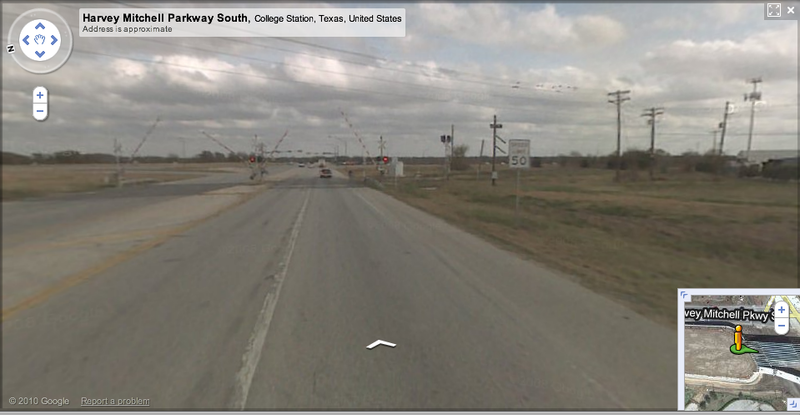 As this often tied in with the "Waco trips" that I took as a kid (to see my grandfather, this is the only time we went up this way), the industrial park and the railroad overpass overhead (which was rarer at the time). 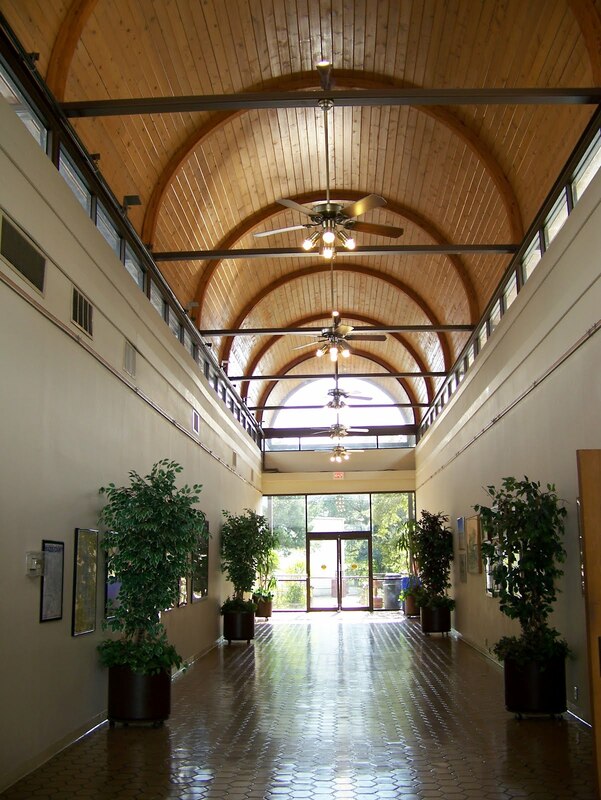 Even further north was the Bryan Business Park, which curiously built the railroad spur network before the businesses came, so there was a railroad coming toward FM 2818 and stopping. It was amazingly strange, to have this "abandoned" railroad just emerging from the distance, cutting through a small field, and ending in a small mound of grass. There was another business closer to Highway 6 in the two-lane section of 2818 that DID have another railroad spur, but I never saw it as a kid and thus was much less interesting. Memories of association of this one with those Waco trips still haunt me/enable me to remember long gone days. On a recent trip to Waco (far less common, to different places) I noticed that the space on the business park that I had always seen was gone, leading me to never discern what it was. Bummer. I did discern that the park was named "Northpoint Business Park", predating the name of a certain apartment complex replacing a certain hotel. They replaced the sign at the very end with a slightly different design sometime after 2007, which I have archived somewhere in my collection of Google Maps Street View screen grab collection. I was saddened when they took out the aforementioned blinking light, and also when they built that gas station/Denny's/truck stop ("Big Gas"? Did they let a ten year old name this? Heck, a three year old named a restaurant, so...) , which gave it more of an urban feel and robbed it of its "last chance Brazos County" look. So that's Stories of the West Loop in a nutshell. You may notice something new on the blog: I've enabled "Share" buttons on this blog, which means you can "+1" this, share on Facebook, Twitter, or the like. I've been to this one, located at the intersection of Villa Maria and 2818 several times. It was built roughly 2007, and one of the few restaurants I've ever heard in 2011 if I wanted to "Super Size" my meal. Maybe they just meant large, but I do remember "Super Size" and how it largely defined the "Golden Days" of McDonald's for me. It was already getting phased out when a certain filmmaker did some sort of hatchet job on the restaurant, so know the truth of what happened. I really appreciate the comments here, keep it up! REMOVED FROM BLOG: This page is no longer supported or updated. By now you've heard of the plan to switch the exit/entrance ramps for Earl Rudder Freeway, to similar to how the ones in south College Station are. What would this mean? The end of the exit/entrance structure as you know it. Here's how I think it would go. The Southwest Parkway/Raintree Drive exit will now be just south of Forest Parkway, and provide access to St. Thomas, The Science Park, and A&M Church of Christ. 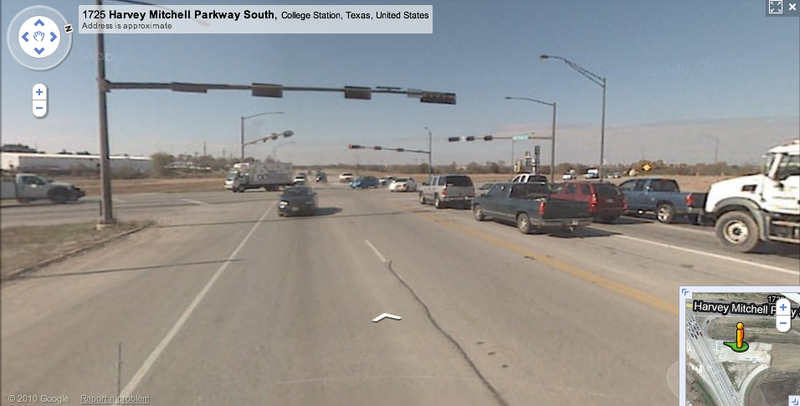 Where the old exit to Southwest Parkway/Raintree was is the new on-ramp from Harvey Mitchell Parkway/Emerald Parkway. The new Harvey Road exit will probably be just south of where the current Southwest Parkway/Raintree on-ramp is now, with this exit providing access to Horse Haven Lane (Gander Mountain, Academy) and Dickey's Barbecue Pit, as well as Aldersgate. The new Southwest Parkway/Raintree entrance then will be just south of Harvey Road proper. It would be the University Drive exit that would be able to access Cinemark the easiest (provided that they could get in the right lane in time, which would be difficult) as well as Douglass Nissan, Varsity Ford, Ashley Furniture, and Ninfa's. Harvey's on-ramp replaces the University off-ramp, cutting into the trees planted on city taxes. It's likely that Oak Hill Drive WILL expand over the freeway in the foreseeable future, and will probably be "prepped" with the new structure. Likely the Oak Hill Drive exit will be in the city limits, cutting into the trees once again. The on-ramp for University Drive will be a little north of where it is now, with the off-ramp for Briarcrest a bit south of where it is now. The Boonville ramp off-ramp would give better access to Atkinson Toyota, Tom Light Chevrolet, IHOP, and Best Western. The old Boonville off-ramp would become the new Briarcrest on-ramp. The new Briarcrest on-ramp is already in place. The old Old Reliance on-ramp becomes the new Boonville exit, with the old Boonville exit becoming the new Old Reliance on-ramp. The old Boonville on-ramp is replaced with the new Briarcrest off-ramp. The old Briarcrest off-ramp is replaced with the new Boonville on-ramp. The new Oak Hill off-ramp would give access to First Baptist Bryan and Lowe's, with the Briarcrest on-ramp being probably merging under the Oak Hill bridge. The University off-ramp would be a bit north of where it is now. 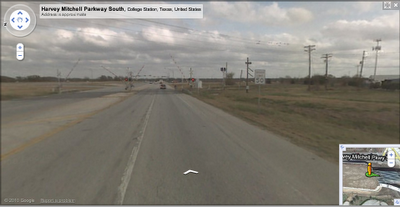 The Oak Hill on-ramp would then, like the northbound way, would be in College Station proper. The Harvey Road off-ramp would replace the old University Drive on-ramp. The new University on-ramp would replace the Harvey Road off-ramp. The new Southwest Parkway/Raintree off-ramp would be where the current Harvey Road on-ramp is. 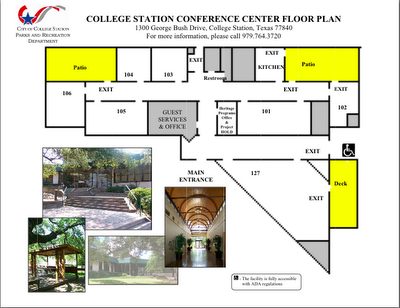 This is the exit that provides access to Holleman (as well as Grand Central Station). 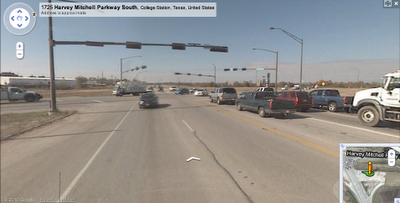 The new Harvey Road on-ramp would replace the Southwest Parkway/Raintree off-ramp. The new Raintree on-ramp would replace the Harvey Mitchell off-ramp. This still leaves Harvey Mitchell without a proper on-ramp, though. This not the official way things would work out, but if they do start it, this is probably the way things would go. The post "Triangle Drive-In" has been removed. It was just one picture from Project HOLD that I didn't know the exact location of.